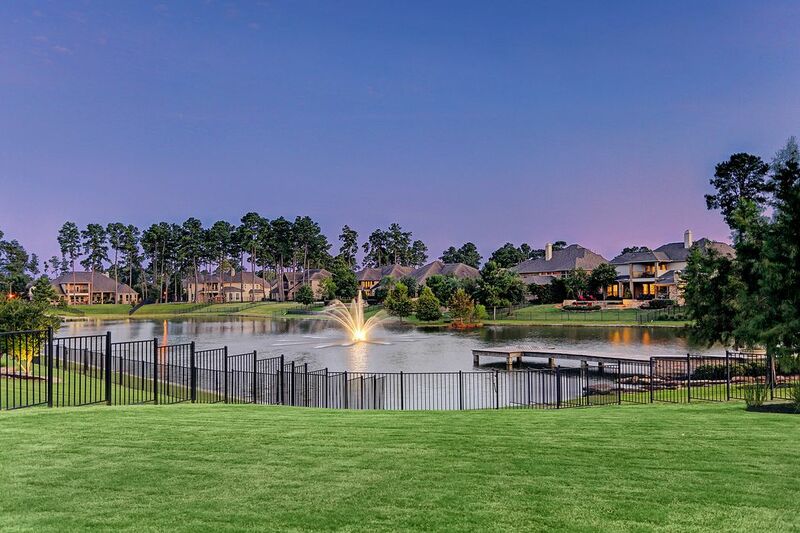 13715 Oak Harbor Manor, Cypress, TX 77429 | Martha Turner Sotheby's International Realty, Inc. 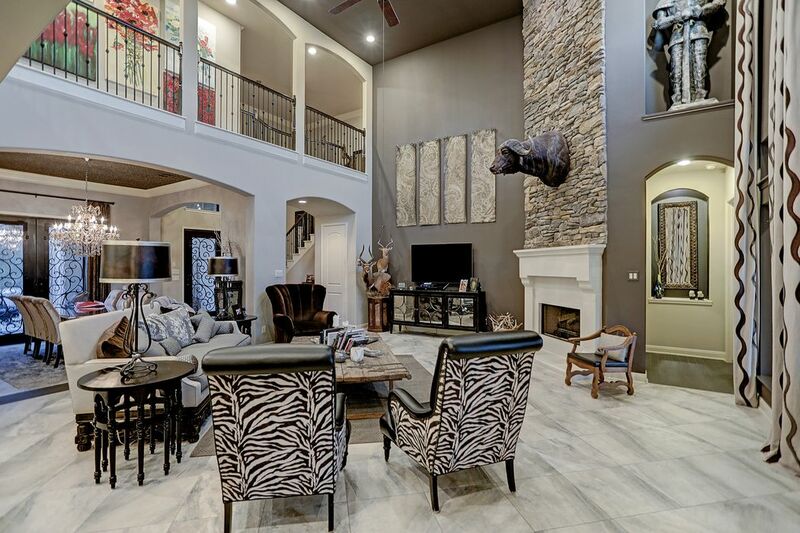 Stunning custom home located in highly desirable Cy Fair School District. 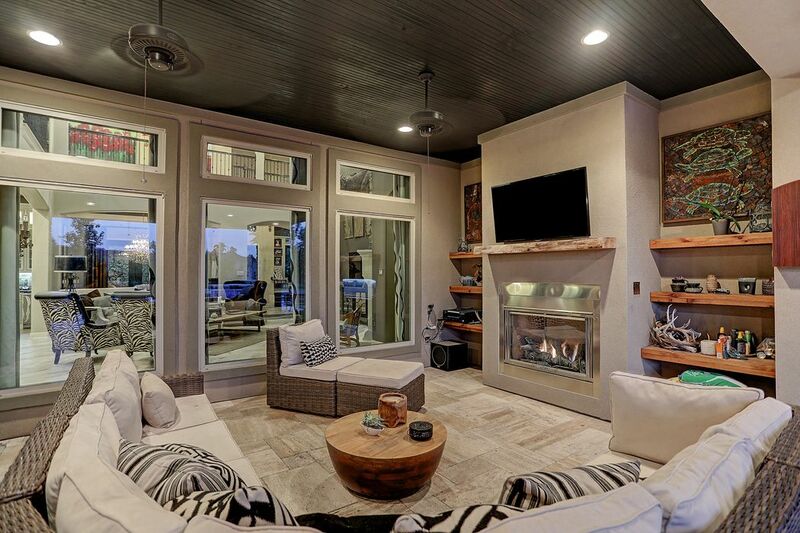 This amazing home, sited on a large corner lot, blends high-end finishes, a family-friendly floor plan, and resort-style backyard to create the perfect family retreat. What a view! 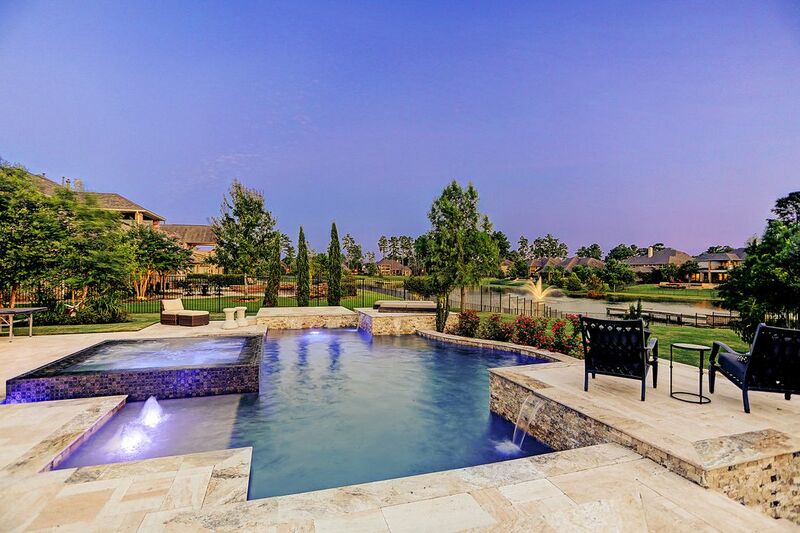 This backyard has it all -- custom pool with spa, tons of yard space for kids and dogs and a gorgeous view of the lake. 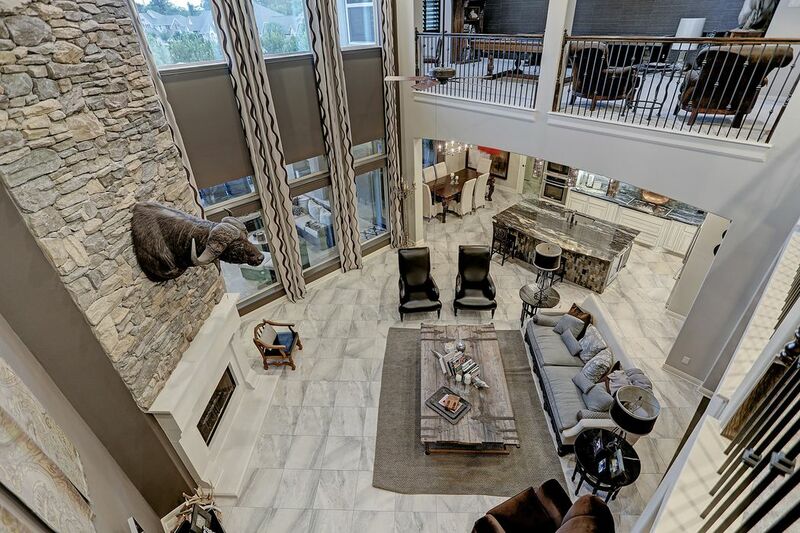 The dramatic two-story family room has beautiful views of the back yard, a stone fireplace with custom surround and contemporary and easy-care porcelain tile floors. 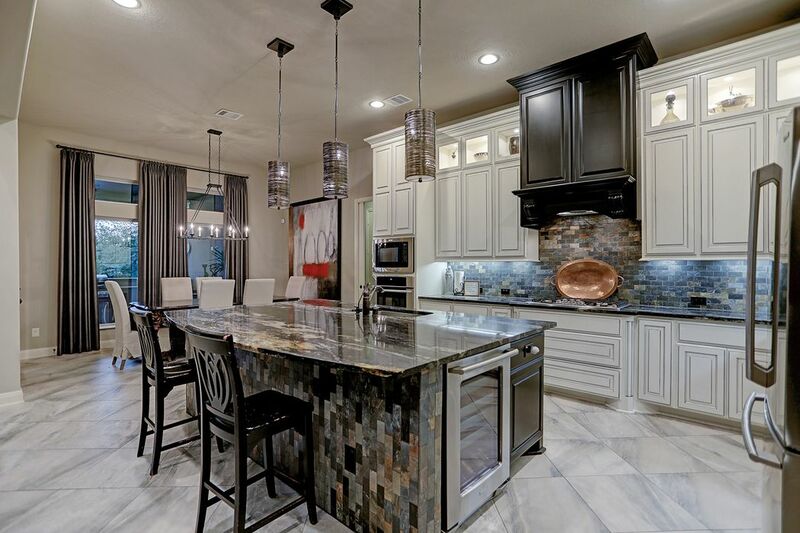 The kitchen features high-end stainless steel appliances (note wine cooler in island), gas range, and exotic slab granite on the island and other counter tops. 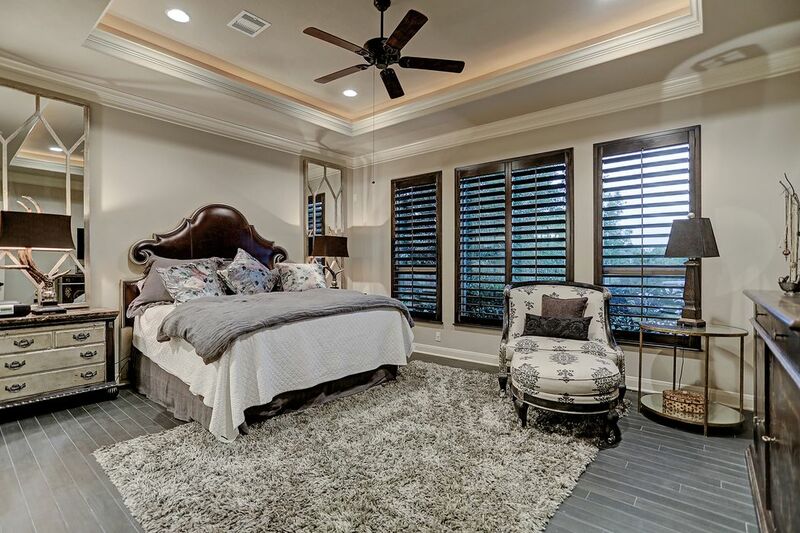 Retreat to this lovely master bedroom with tray ceiling, custom plantation shutters, tile floors and beautiful views of the back yard. 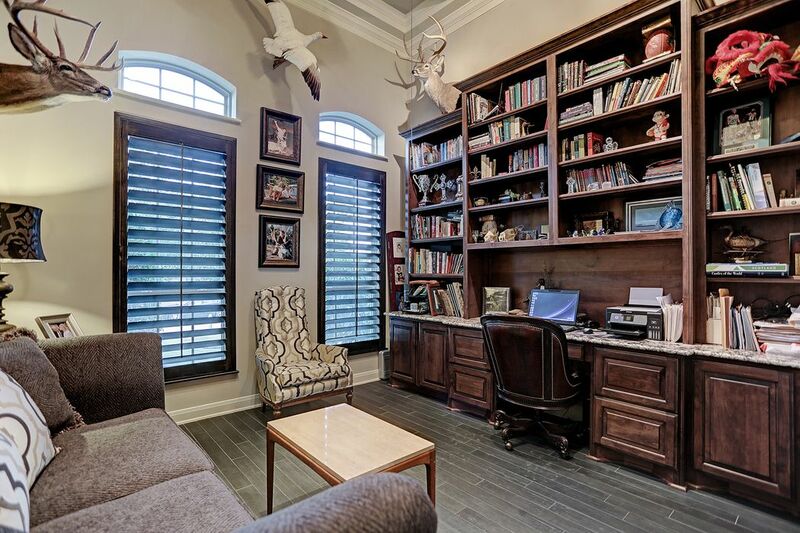 Conveniently located at the front of the house, this roomy study has tile floors, custom built-in bookcases with tons of storage and granite countertops. Enter this amazing home through the cozy courtyard. The double doors lead to the dining room and can be opened to create a wonderful indoor/outdoor space. Gas log fireplace at the left. 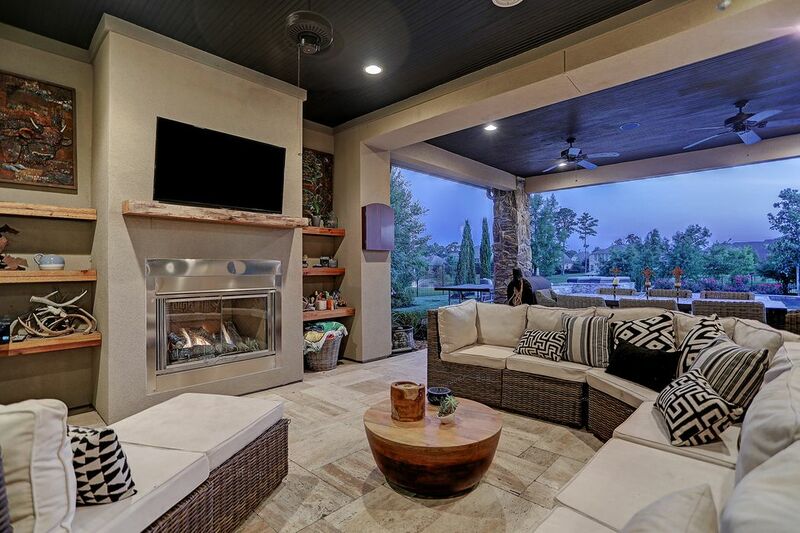 This outdoor "family room" features a gas log fireplace, travertine tile and plenty of covered space to enjoy your favorite television programs. 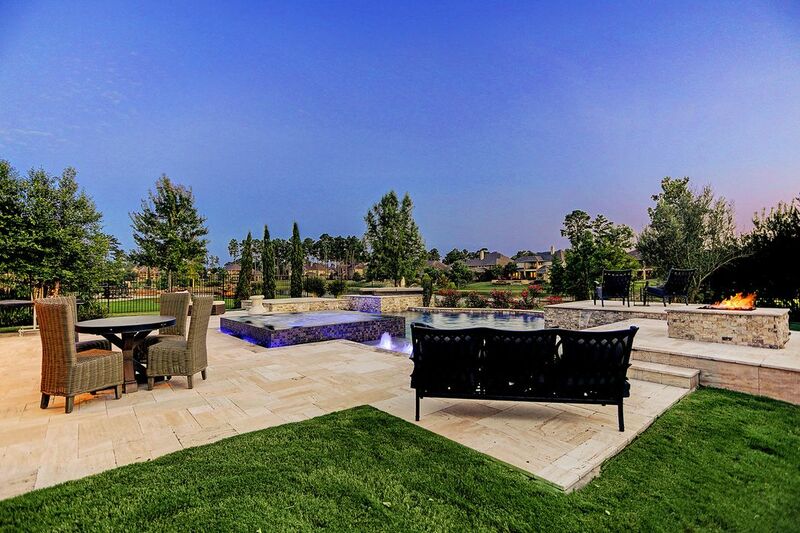 Beautiful views of the pool and backyard beyond. Another view of the lighted pool with the dramatic fire pit to the right. The view from above looking at the family room and kitchen and breakfast room beyond. The upstairs game room is at the top right of the photo. The custom family room drapes will stay with the home. From this perspective, you can see the double dining room doors (left) which lead to the front courtyard and the front door and foyer to the right. 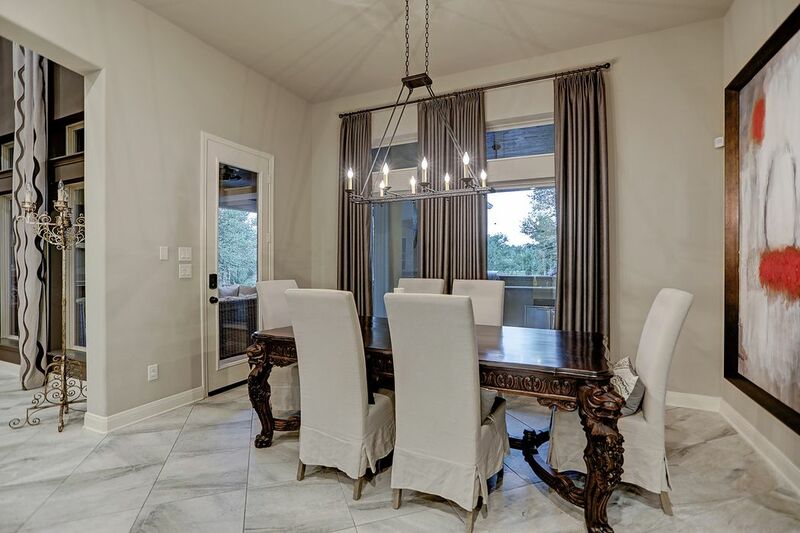 This sophisticated dining room features subtle wallpaper on the ceiling and looks out to the foyer and staircase. The kitchen is conveniently located to the right. A bar with ice maker and extra storage if just beyond the kitchen to the right. The door leads to a huge walk in pantry. The door on the left leads to a downstairs bedroom, full bath and large laundry room. 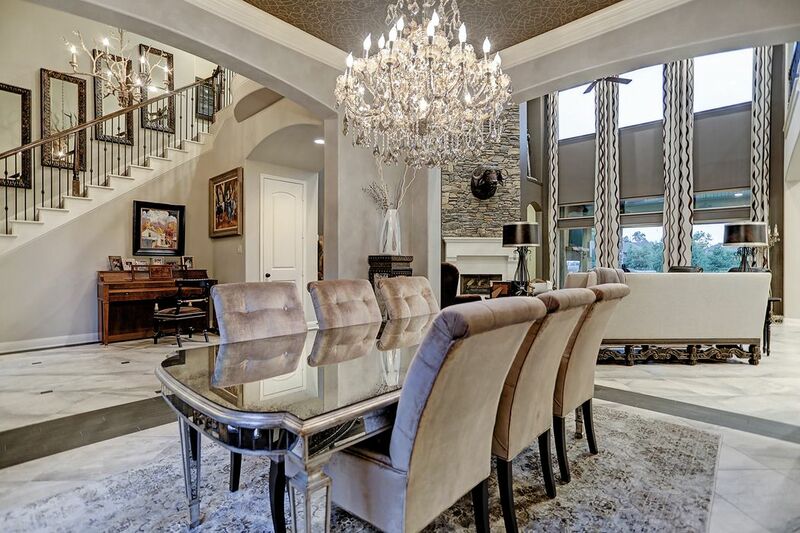 The breakfast room, with designer chandelier and custom drapery looks out to the backyard. 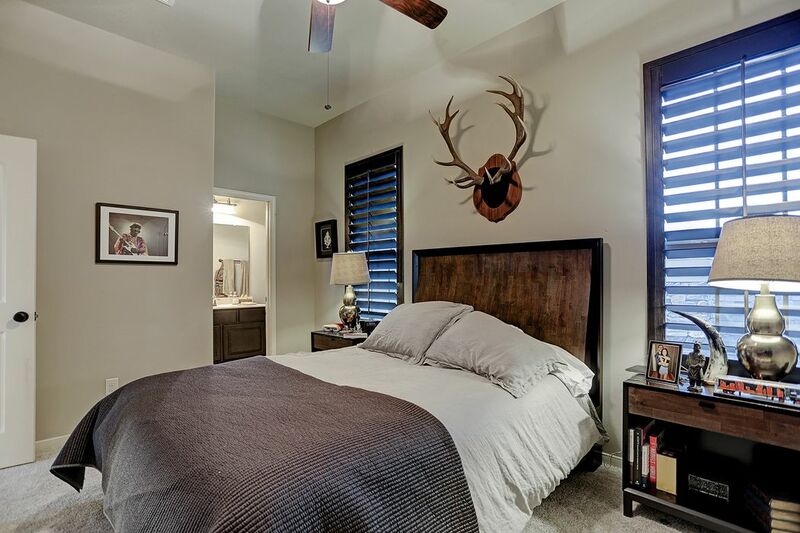 The master bedroom, conveniently tucked behind the family room, is huge with plenty of space for oversize furniture. 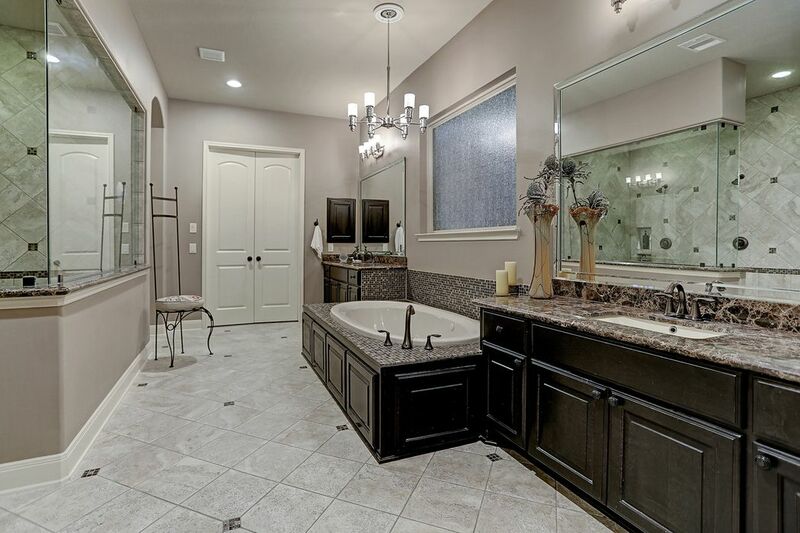 The master bath with dual vanities, soaking tub with glass tile surround and designer lighting. The double doors lead to a huge closet. This perspective shows the dual shower heads and linen closet. Upstairs secondary bedroom with plantation shutters and ensuite bath beyond. Another secondary bedroom located on the second floor with custom plantation shutters and ensuite bath. 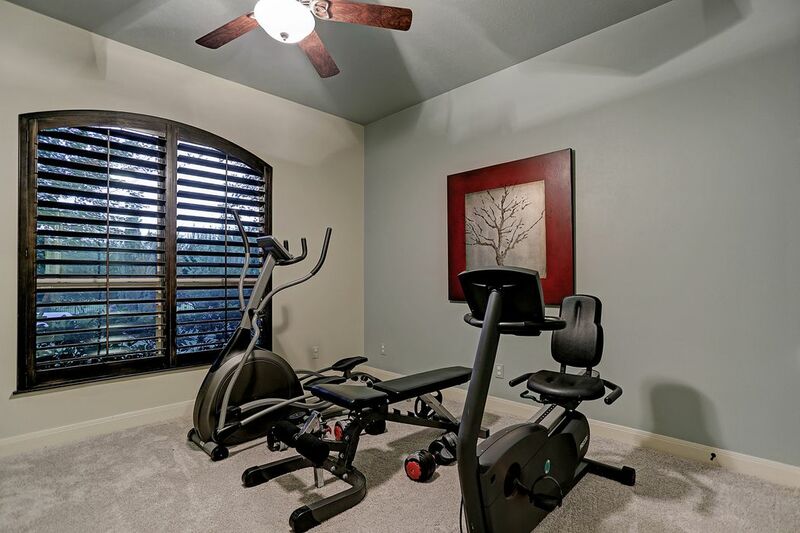 This first floor bedroom is currently being used as a weight room. There is a full bath next door. 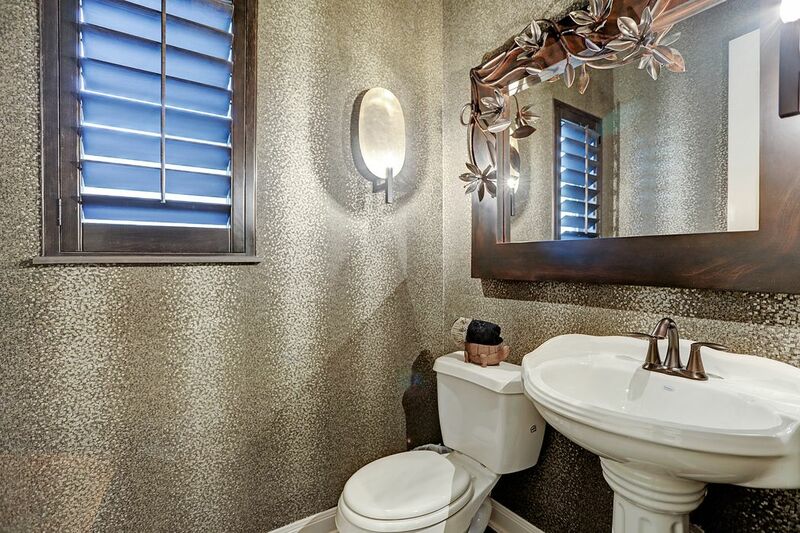 This full bathroom features a marble tile walk-in shower and custom designer wall covering. 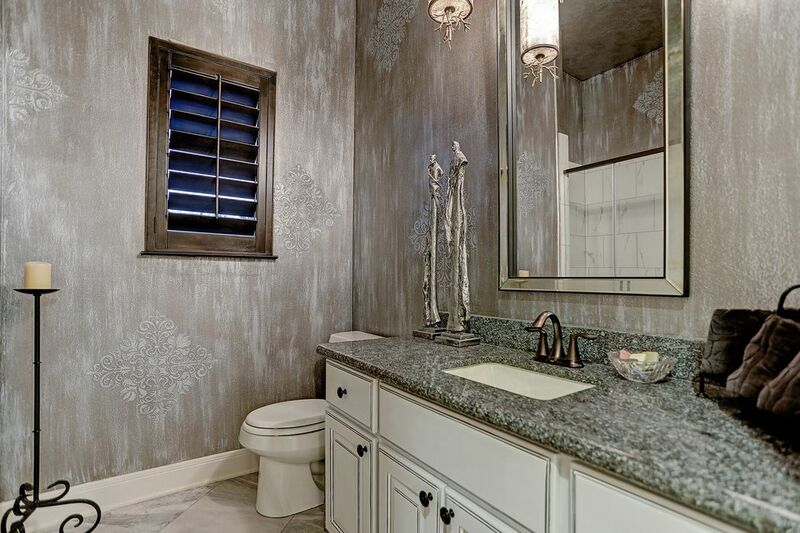 First floor powder room boasts custom lighting and designer wall covering. 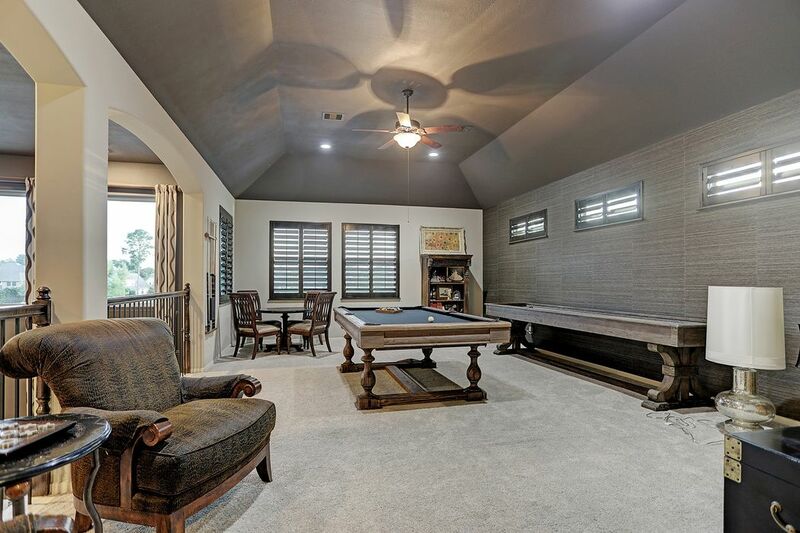 Located upstairs and looking down dramatically to the family room, the game room is defined by a tray ceiling, designer wallpaper and windows looking out to the backyard. 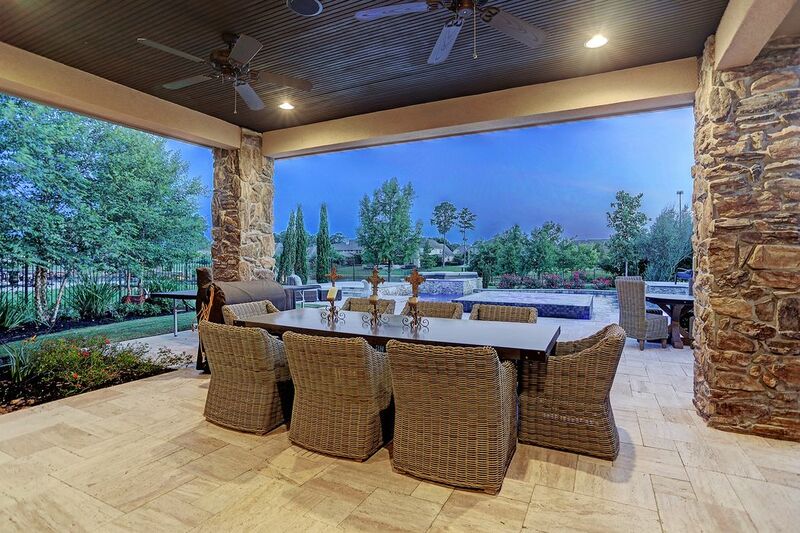 The backyard "dining room" looks over the pool. 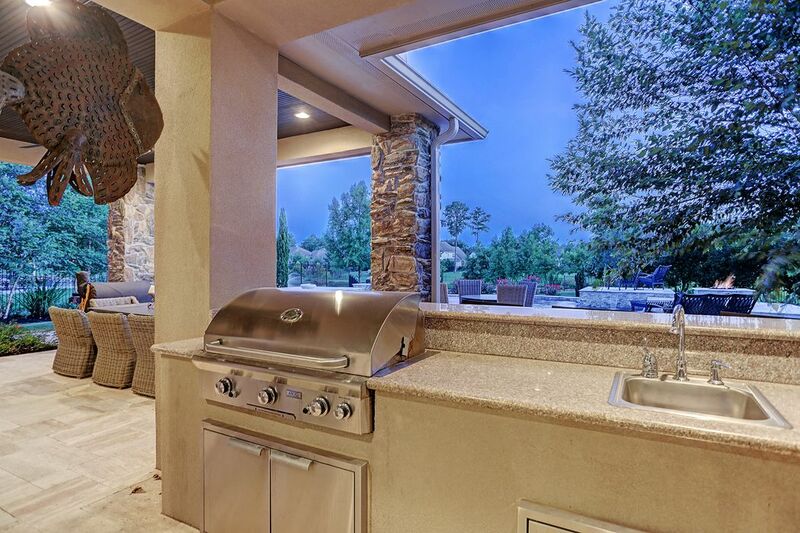 Summer kitchen has a grill, sink and tons of storage. This is conveniently located off the kitchen. Another look from the pool area back into the house. The front courtyard. To the right of the fireplace is a door leading to the 3rd garage. A side view of the house. Large garage can accommodate three cars (one tandem bay) and has lots of storage space. 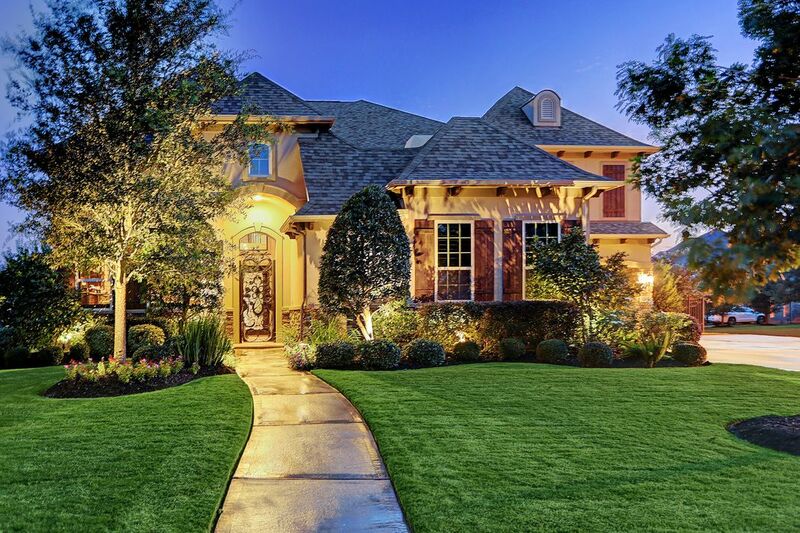 What a wonderful view of the backyard looking towards the house! The area lake is dramatically lighted in the evenings. 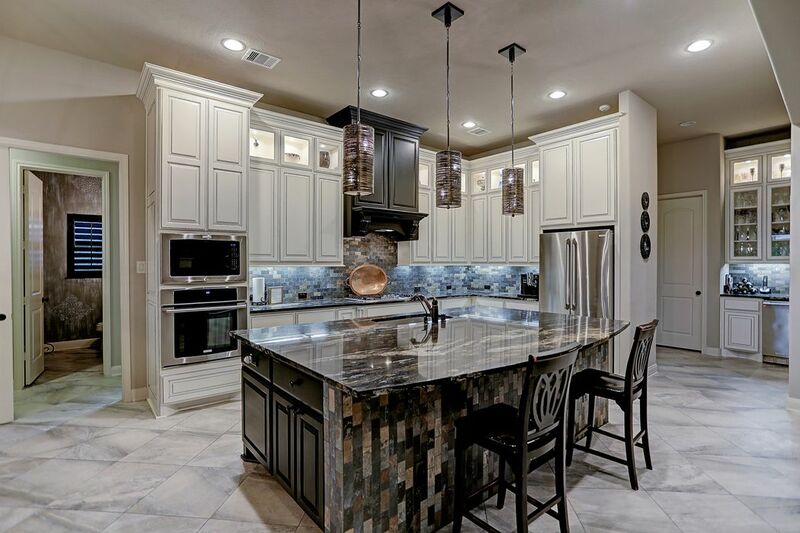 $790,000 4 Bedrooms4 Full / 2 Partial Baths4,841 sq. ft. 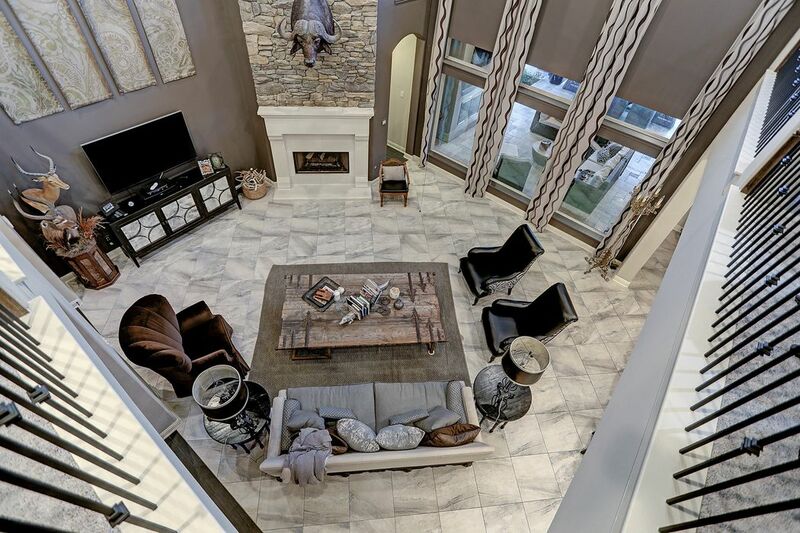 Stunning custom construction with tasteful upgrades throughout. 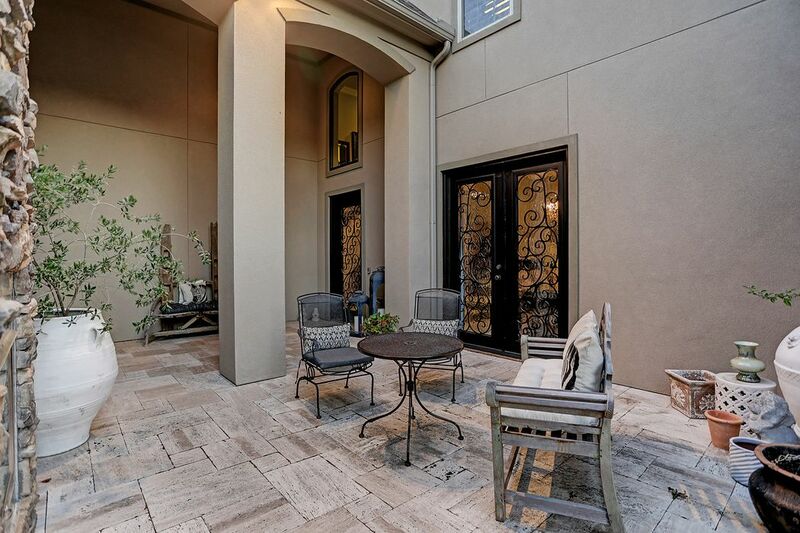 This home combines sophisticated interiors with resort-style exteriors providing the best in Houston living. 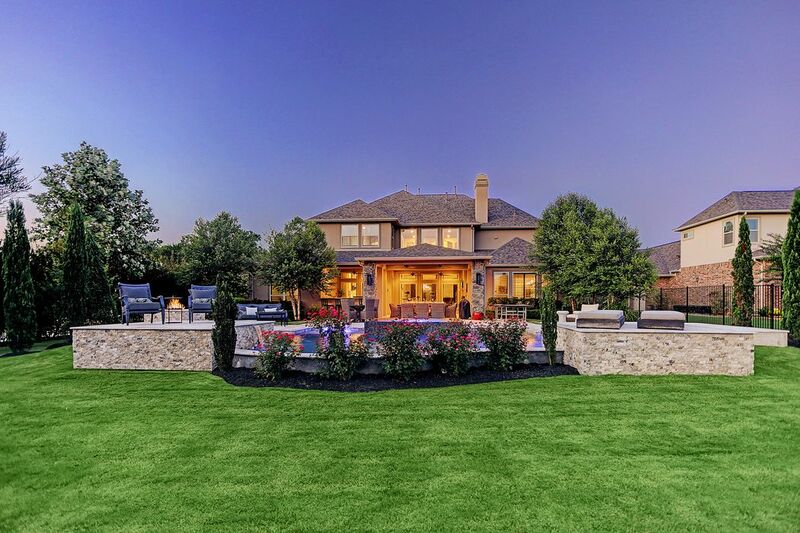 Located on a coveted water lot, the summer kitchen and covered sitting area look over the gorgeous pool, down the expanse of yard to a beautiful water feature in the lake. 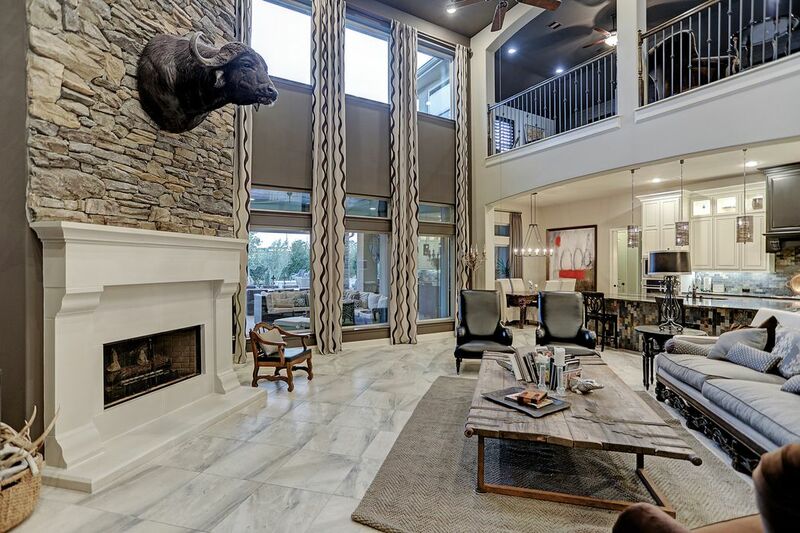 Interiors are just as stunning, with open concept kitchen, dramatic two-story ceiling in living room, highly desirable master and extra guest room down. 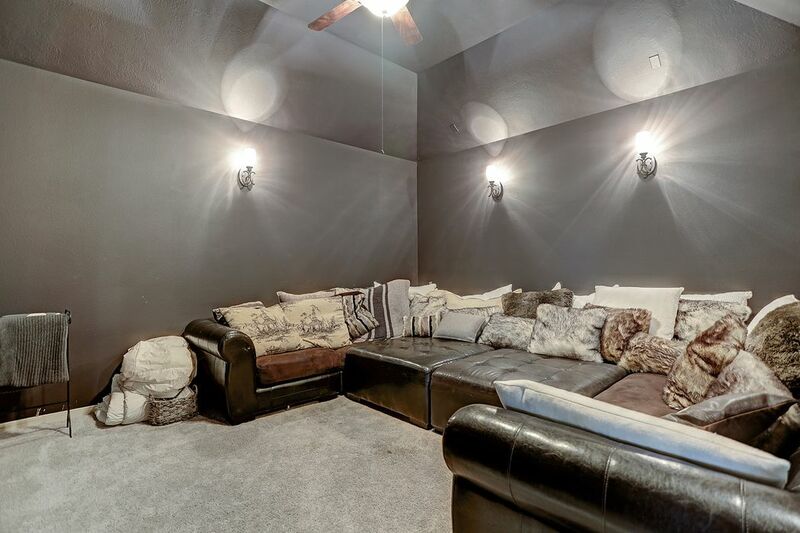 Media room, game room and two bedrooms are located upstairs. 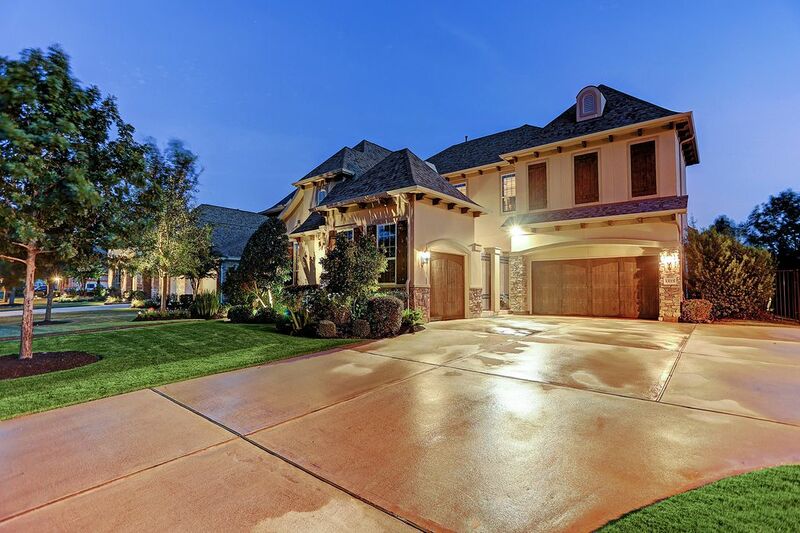 There is also a study and garage space for up to four vehicles. 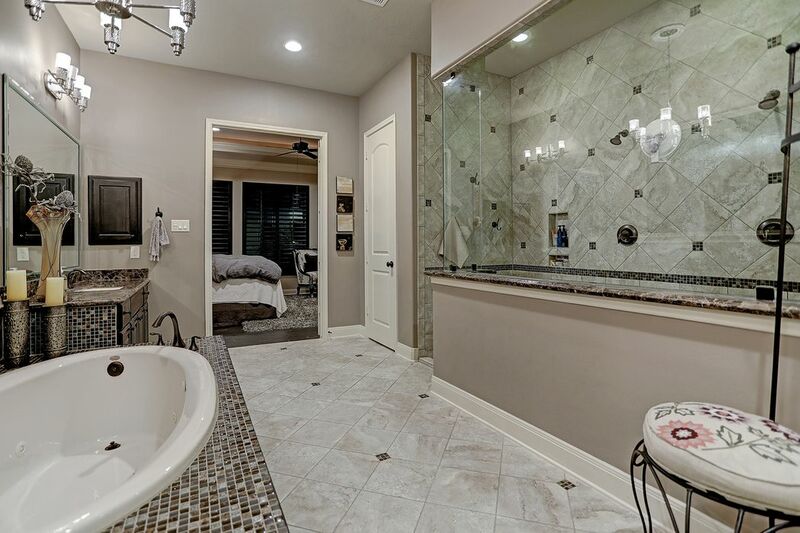 Upgrades include porcelain tile floors downstairs, exotic kitchen island granite, designer wall finishes in the powder rooms, all light fixtures, stone fireplace in living room, granite and tile in master bath. 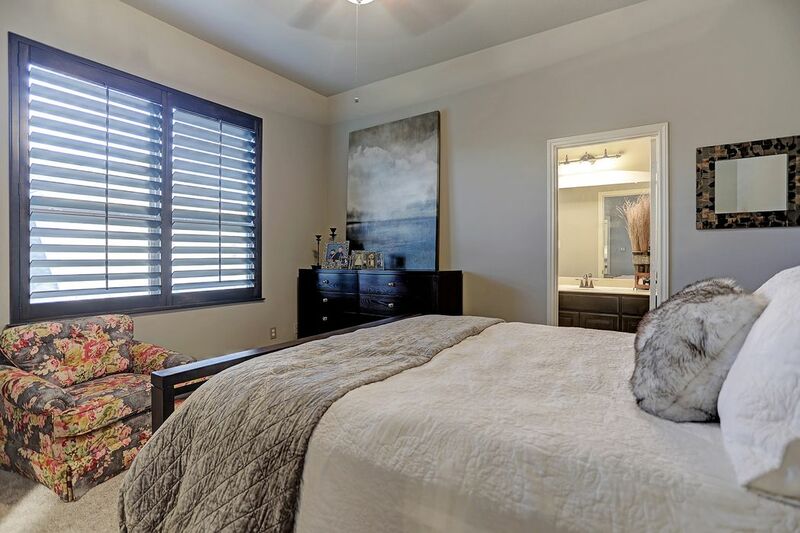 Window coverings include custom draperies and plantation shutters. 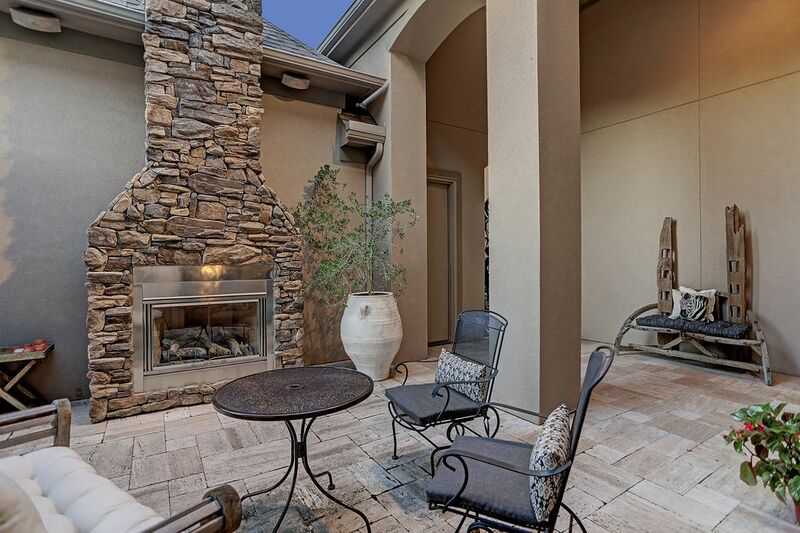 The sophisticated entry features a covered patio with gas log fireplace and oversized iron door.